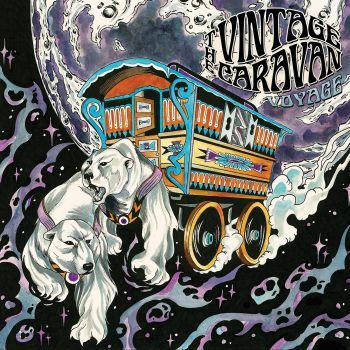 THE VINTAGE CARAVAN - VOYAGE BLACK VINYL (2LP) | Online Shop | Wizard LTD. Album: "VOYAGE BLACK VINYL (2LP)"
Reykjavik, Iceland, 2006. Two 12 year old kids named Oskar Logi and Gudjon Reynisson decide to form their own band. Inspired by the tasteful record collections of their parents, the duo rudimentarily starts to work on music. THE VINTAGE CARAVAN is born. Three years in, the band had already written and recorded their self-titled debut album which eventually would be released in 2011. Drawing attention with the more psychedelic bluesy direction of their early material, THE VINTAGE CARAVAN soon would play all around Iceland, gaining more and more fans – and not only in their native. Just a few months later, in late 2012, »Voyage«, the band‘s second effort is being released through one of Iceland’s biggest record labels. Unfortunately though, »Voyage« does not make its way across the home country’s borders and not many people are able to take notice of the stunningly performed classic rock, these youngsters have to offer. Mid 2013, Nuclear Blast finally get to hear the album, resulting in an immediate deal offer. Even though the band’s influences (KING CRIMSON, LED ZEPPELIN, YES, GENTLE, BLACK SABBATH, JIMI HENDRIX, CREAM or DEEP PURPLE) definitely can’t be denied, the three-piece puts their very own vibe to the classical yet modern sounding rock. Tracks like the trippy ‘Expand Your Mind’ (the hilarious official music video hit the scene like a bomb or the groove-ladden ‘Midnight Meditation’, capture the listener upon the first spin and make one feel to have known these tunes for at least 40 years. Now, finally everyone can enjoy the slightly progressive, jammy, trippy and touchingly deep songs of »Voyage« - get some shrooms ready, lick your favourite pet and “take a trip” – THE VINTAGE CARAVAN will change your life!